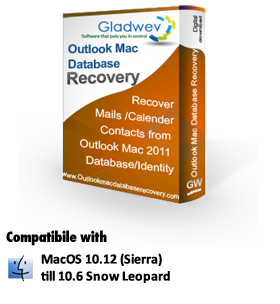 Outlook Mac Database Recovery - Most Advanced Outlook Mac Database Recovery Tool! - Comes Backed with Free Premium Support. That is right, If you get stuck, Our Experts will help you out with a complete recovery! So purchase with out worries! The Advanced Tool for Outlook Mac Database Recovery is finally here and will take care of all your Outlook Mac Recovery issues for you from this day forward. If OLM Recovery was what you were planning to use for Outlook Mac Database Recovery then you should definitely give it another thought and learn more on how OLM Recovery has been replaced with a far better and technologically advanced Outlook Mac Database Recovery which we have proudly brought forward for you. Why old method of Outlook Mac Data recovery using OLM Recovery is not good ? Try Exporting OLM files multipe times from outlook and you will notice a file size difference every time you export, this is a indicator of possible data loss or corruption. The loss you might realize later, after recovery. While recovering mails other OLM Data Recovery products crash or are leaving out some percentage of Mail data when attempting the OLM recovery process. You are experiencing Errors and Outlook Mac Crashes while exporting Outlook Mac Mail data to OLM files. Because of these issues reported by many of the users worldwide, we worked on a technology that could help recover data directly from the original source files of Outlook Mac Database. Users were not happy with OLM file Recovery Tools by other vendors and their inaccurate data recovery, so we came up with a more technologically advanced method to take care of all these problems arising from the OLM files themselves during Outlook Mac Mail Recovery Process. Outlook Mac Database Recovery is the most recent app added to our existing line of Mail Migration Apps used by novice and Pro's worldwide. It is far better than the previous used method of OLM Recovery as can be understood from the above mentioned pointers. After reading this information about Outlook Mac Data Recovery, we hope it won’t be difficult for you to figure out what is the best possible way to achieve the same. Outlook Mac Database Recovery is the latest innovation when it comes to Outlook for Mac Data Recovery Tools and we are the proud inventers of this Outlook Mac Database Recovery Tool that works on the basic principle of recovering the data direct from where it matters. Not being dependent on a source which itself is susceptible to corruption or data loss, which in this case is the OLM Archive file. There is no other tool which uses this technology and this tool is at par the best possible choice for Outlook Mac Data Recovery. Go ahead, give it a try right Now!! Experience the difference! Outlook Mac Database Recovery Tool is without the slightest of doubt the next step in Outlook Mac Data Recovery. Forget about OLM Recovery Tools when thinking about Outlook Mac Data Recovery and conversions now. Go with the most advanced Data Recovery Tool for Outlook Mac Database and get rid of any problems arising from corrupt and inaccessible OLM files.